The Waygo API allows you to extract text from images, also known as OCR, in a way that is automatic and scalable. 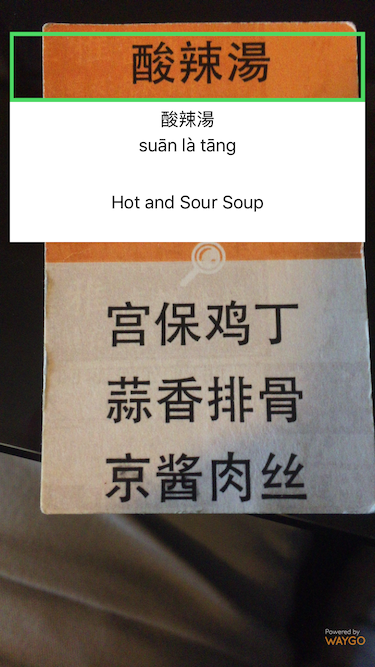 The API currently supports text extraction of Chinese, English, Japanese and Korean. The detect endpoint returns the position, color and background color of detected text. If you have any questions about the Waygo API or the documentation, please reach out to sdk@waygoapp.com. Waygo uses API keys to allow access to the API. You can request a new Waygo API key by contacting us. This endpoint detects the lines of text in an image, and returns the positions, colors and text of the detected text. It will also return an English translation and an English romanization of the text, if the source language is not English. If the source language is English, the translation and romanization fields will currently mirror the value field. image (required) is the image to be used for detection, attached as part of a multipart-encoded request. lcSrc (required) is short for “language code, source”, and represents the language code of the language that should be detected in the image. See the POST Form Parameters section for available language codes. lcTgt (optional) is short for “language code, target”, and represents the language that should be translated into, if any. This defaults to English. See the POST Form Parameters section for available language codes. type (optional) is a hint for what kind of text should be expected in this image. Different Waygo language and OCR models are optimized for different use cases, and when applicable, this hint can boost performance in certain situations. The available types right now are default and receipt. Use receipt when it is known that the source image contains a receipt, invoice or similar document. Use default in all other cases. romanization contains a pronounceable version of the detected text. The precise romanization depends on the language. 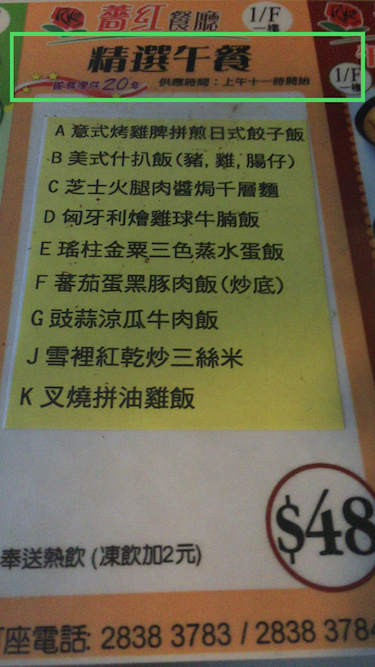 For Chinese, the romanization is pinyin, while for Japanese it is a version of romaji. shape contains a list of points for the shape that fits around the detected text. In most cases, this will be four coordinates representing the four corners of a rectangle. The coordinates are given in clockwise order. score contains two keys, recognition and translation. Both are values between 0 and 1, with a score of 0 representing very low certainty in the result, and a score of 1 representing the highest certainty of a good result. These values are approximations of how accurate the results are, and can be used to selectively show or filter certain results. image Yes - The image to be used for detection, attached as part of a multipart-encoded request. lcSrc Yes - The ISO language code of the source language, or in other words, the language of the text in the image. If zh is specified, the API will automatically handle both simplified and traditional Chinese text. lcTgt No en The ISO language code of the source language, or in other words, the language to translate to. Currently, the only valid option is en (English), and the parameter is not required. type No default A hint for what kind of text should be expected in this image. Use receipt when it is known that the source image contains a receipt, invoice or similar document, and default otherwise. Remember — all requests require a valid API key for authentication. The fields field will only be set if there is an error related to a specific field in the request, otherwise it may be left out. The message field will give a human-readable description of the error. 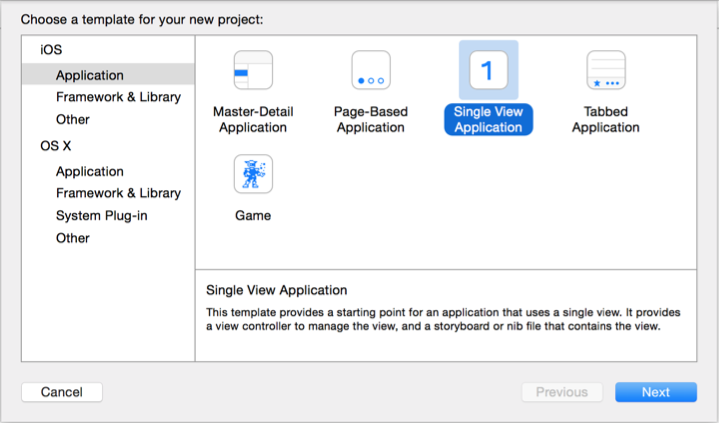 If you are creating a new iOS app, open Xcode and select File > New > Project and select a Single View Application and name it whatever you want. For the purposes of this tutorial, we have named ours WaygoSample. Make sure that your project Language is set to Objective-C. This tutorial is designed for an iPhone so we have set our Devices to iPhone. 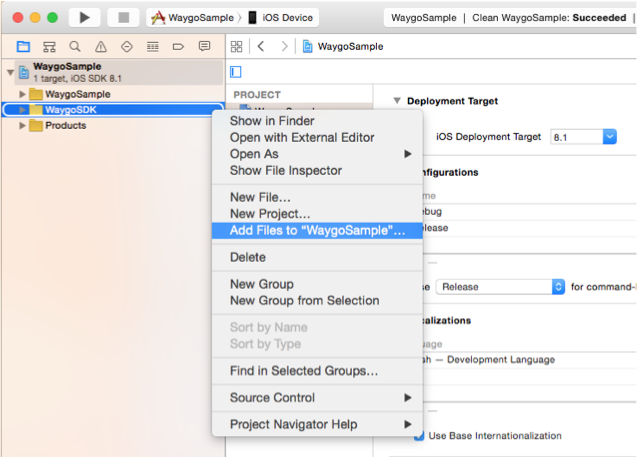 Create a new group (folder) in your project and name it WaygoSDK. 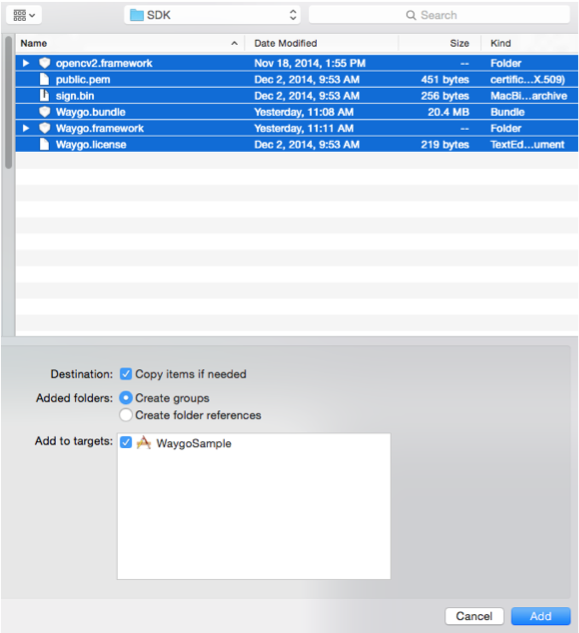 Right­ click on this folder and select Add Files to “WaygoSample”. 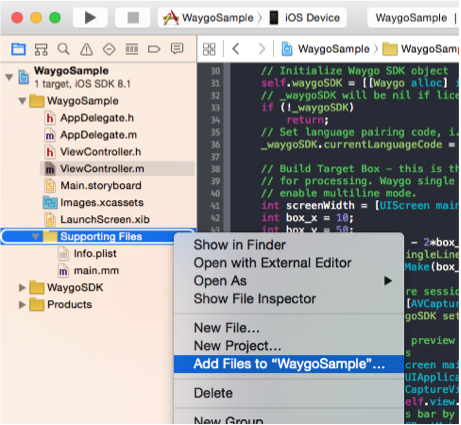 In the window that follows, navigate to your WaygoSDK_iOS folder and open the SDK folder. Select all files in this folder (Waygo.framework, opencv2.framework, Waygo.bundle, Waygo.license, public.pem, sign.bin). Select Copy items if needed so that these resources will be copied to your project folder. 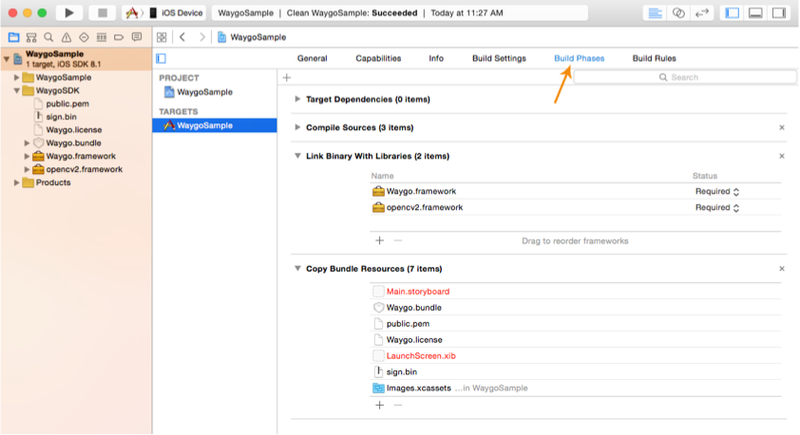 Verify that the files have been added correctly by going to the Build Phases tab of your app target settings and expanding the Link Binary With Libraries and Copy Bundle Resources sections. 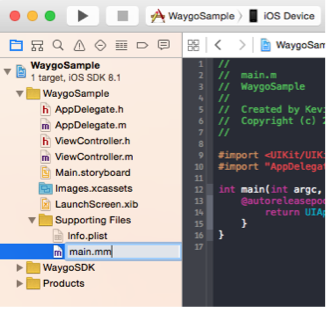 The Waygo SDK requires 2 standard libraries to run properly. The libraries are libc++ and libz. Before leaving the previous screen (your app target Build Phases), click on the + at the bottom of the Link Binary With Libraries section. 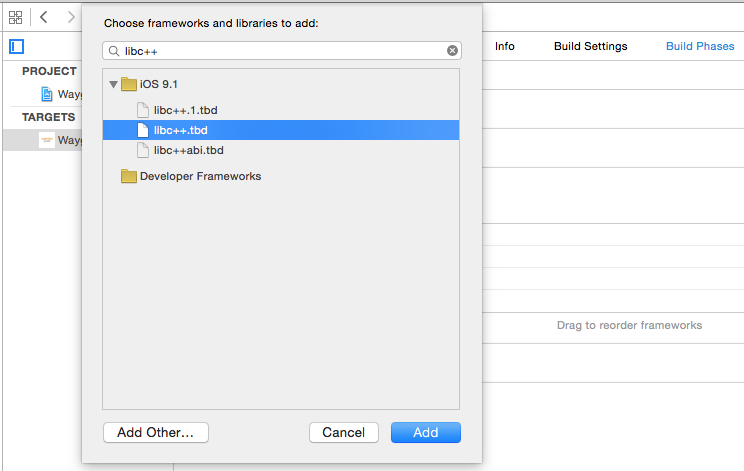 Select libc++.tbd and libz.tbd from the list and click Add. The Waygo SDK is built for the standard mobile architectures (armv7, armv7s and arm64). Your project must build for at least one of these architectures and cannot be built for anything other than these three (Waygo does not run on armv6, or the simulator). Set your project Architectures accordingly. 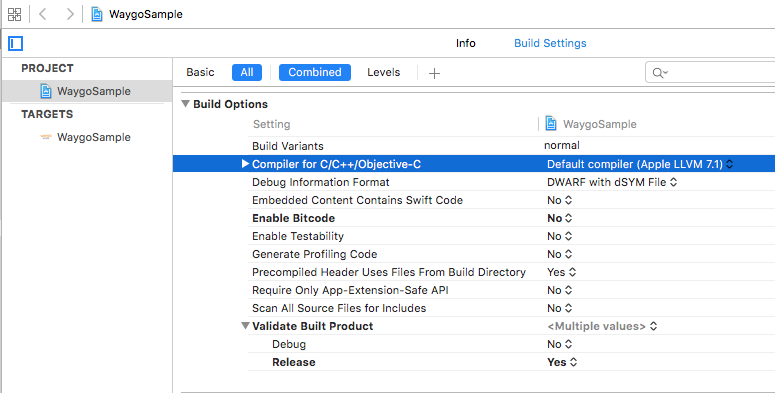 Make sure you are using the default Apple compiler, in this case Apple LLVM 7.1. Next, make sure that your project folder $(SRCROOT) is included in your Framework Search Paths. 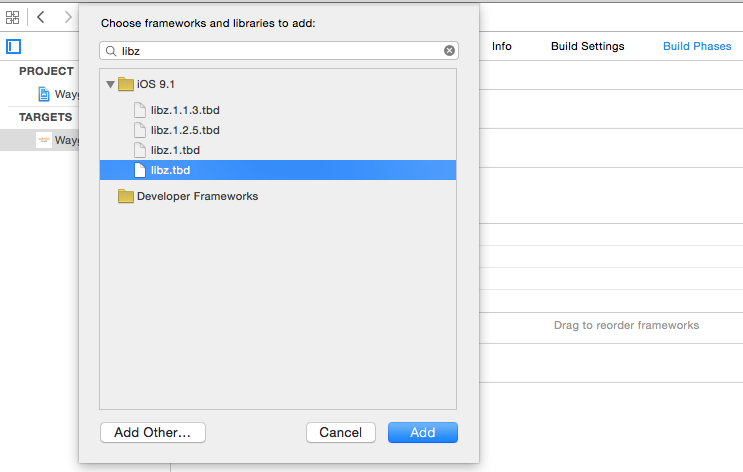 The Waygo SDK does not make use of Bitcode so set it to NO in your Project Build Settings. The Waygo SDK is built with C++. 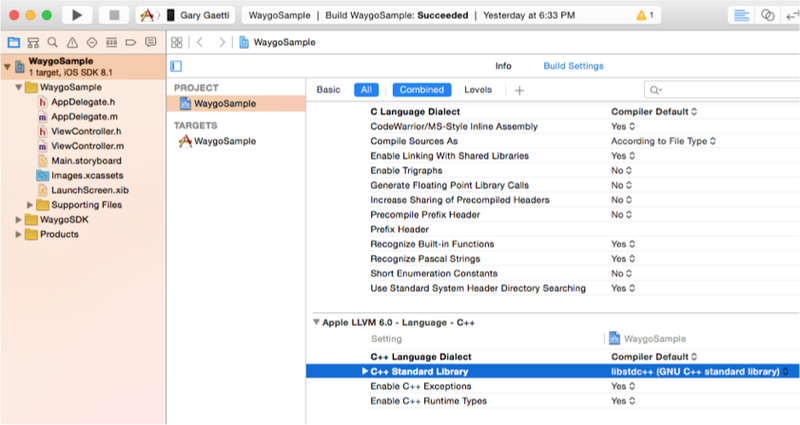 Your C++ compiler settings much match that of the Waygo SDK. Set your C++ Standard Library to libstdc++ (GNU C++ standard library). Finally, because the Waygo SDK uses C++, you must modify your app’s main.m file extension to main.mm which will enable your app to run C++ code. Go to the header file for the view controller (ViewController.h) in which you want to run Waygo from. You need to import <Waygo/Waygo.h> and make your view controller conform to the AVCaptureVideoDataOutputSampleBufferDelegate protocol. You will now initialize the Waygo SDK, set the language pair you wish to translate, and build the target box. In the viewDidLoad method of your view controller, enter the code shown in the screenshot. During the Waygo initialization, your license will be verified. If your license verification fails, the waygoSDK object will be nil in which case you should not proceed with further setup. See the Waygo.h file for all possible language codes. Only languages that are included in your license agreement will be available to use. ￼ After building your target box in viewDidLoad, you will now initialize your captureSession. The Waygo SDK will take care of most of the set up. You must then set up your camera previewLayer which displays the live feed that the device camera sees. The code below sets the preview layer to take up the full device screen. Enter the code shown below in viewDidLoad after initializing the Waygo SDK. As each new frame of video is captured by your app, the image will be sent to the captureOutput:didOutputSampleBuffer:fromConnection delegate method. This method is part of the AVCaptureVideoDataOutputSampleBufferDelegate protocol that we set up in our ViewController.h file. Add the method below to your ViewController.m. We skip processing if the camera is currently adjusting focus. We send the imageBuffer and targetBox to the SDK where the image will be cropped using the targetBox frame and translated. The SDK will return a NSArray of WaygoTranslation objects, 1 for each line of text that was translated. Now go back to your viewDidLoad method and start the captureSession. This will allow the delegate method you just created to be called by captureSession. We need to show the targetBox on the screen to give the user a visual target for where to center the text. Let’s add the target-box.png image from the WaygoSample project folder to our project. With the target-box image added to our project, let’s assign the image to our targetBoxView, then set the targetBox rect equal to the targetBoxView frame. Add this to the bottom of your viewDidLoad method. Single line requires a target box height of 70 pixels. // cropped and sent to the Waygo SDK for processing. The core functionality of the sample project is now complete. You can run the app on an iOS device to check that it builds correctly and you see the camera preview with target box visible on the screen. The app doesn’t appear to be doing anything interesting right now. We need to add some text labels to the screen to show the user the translations. Let’s go back to the @interface of our ViewController.m and add some UILabel IBOutlets to show the recognized text, the romanized pronunciation, and the translation. Now we need to extract the WaygoTranslation object from the array returned by the waygoSDK and display this information on the screen using our labels we just created. 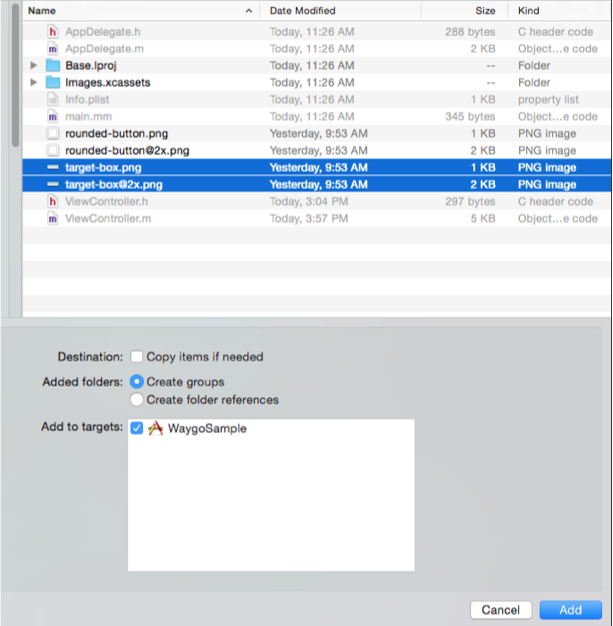 Modify the captureOutput:didOutputSampleBuffer:fromConnection delegate method to retrieve the WaygoTranslation object from the returned array. Because the camera runs on a background thread, we must use GCD to update the UI. Now let’s implement the displayTranslation method we are calling from the camera delegate method. This method will take in the WaygoTranslation object and set the text of our three labels. See the WaygoTranslation.h file for a description of each property. Finally, let’s add the Waygo watermark to the bottom right corner of the screen. Add an IBOutlet for UIImageView *watermarkView and then attach the image using this code at the end of your viewDidLoad method. That’s it! Your project is now ready to translate single line text in real time using the Waygo SDK. Take a look at the included WaygoSample project for some additional features such as switching to Multi Line mode, pausing a translation, implementing a torch, and handling landscape. Run your project and try translating some phrases! The Waygo Android SDK documentation for offline mobile OCR is not currently available online, but if you are interested in using our Android SDK, please contact us for the SDK key and documentation.